Karan Johar being open about his sexuality not every time but once written in his book deserves some peace and space. Why people not live and let live? Why some trollers do not understand that celebs do have sentiments and they too don't like bragging one thing. Every now and then, Karan Johar face questions on hi sexuality. This has become the subject of memes and trolls and we ask why? Well, nobody has the answer! Recently, a troller on Twitter commented on an interview video of Karan with a journalist and the words were, "So a chhaka is interviewing another chhaka." 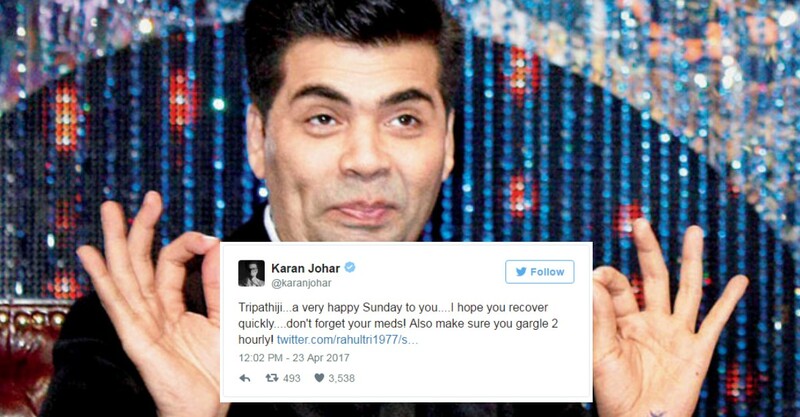 To this shameful act, Karan Johar chooses to reply him instead of avoiding or being silent. He responded by saying, "A very happy Sunday to you....I hope you recover quickly....Don't forget your medicines! Also make sure you gargle..."
This is not the first actor who is suffering from cheap comments, Bollywood actors like Shah Rukh Khan. Sonakshi Sinha and Alia Bhatt too faced it. Well, it's high-time that people understand their lines and limits.